The world economy is slowing down faster than expected, warned the International Monetary Fund on Monday (21 January) hours before the opening of the World Economic Forum in Davos. China’s deceleration, Brexit and the risk of an escalation in the trade war are weighting on the global output. Against this backdrop, pessimism is growing among CEOs, noted the latest global survey published on Monday by PwC, the world’s second largest professional services firm. 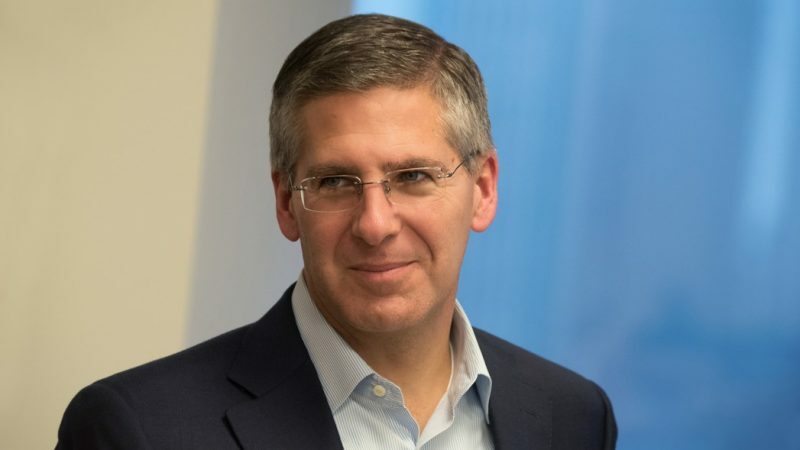 In an interview with EURACTIV.com, the global chairman of PwC, Bob Moritz, recommended companies and governments to focus on speed and execution in order to turn risks into opportunities. Bob Moritz is PwC’s global chairman. He spoke with EURACTIV’s Jorge Valero during the World Economic Forum in Davos. To what extent the global slowdown anticipates a new recession? Based upon the stats that we have gotten from the CEO’s survey, there is definitely a decreasing level of confidence in the economy and decreasing level of confidence to deliver against the objectives CEOs have set. But we don’t see this as an automatic step toward recession. In fact, if you look over the past 21 years or so, there is actually a good correlation between the CEOs’ confidence level and GDP growth in terms of where it stands today. So I would say more importantly, what we see is a slowing economy, not one that is catastrophic going in the wrong direction, or one that is going into recession per se. The question is how countries and companies think about operating in the environment of a slowdown, rather than in an absolute recessionary period. One of the factors behind the output decline is the trade war between the US and China. Do you think the trade tensions will only get worse, as US President Donald Trump’s ultimate goal could be to contain China? I am not sure I can predict where the trade wars are going, nor the motives of President Trump. But it is clear that there are some significant challenges that not only go to trade, but also intellectual property and other related aspects. I do think that tensions will continue. While one day we may see hope, the next day we may see some volatility. The message here is there is going to be a lot of ups and downs. Therefore, the issue is how we make sure that CEOs and country leaders do not deal with the short term ‘ups and downs’, but the longer term trend. China is a country still has a lot of upside. Even though today we heard it was slowing down in terms of its growth from last year, with 1,4 billion people and growth above 6%, even if that goes to 5% or 4%, still there are a a lot of opportunities for both Chinese corporates and the Chinese government to focus on, but also the market share that other organizations outside China want to be doing business with. When we asked CEOs, some of them said they were changing their strategy for supply chain, or in terms of consumption, or investment into those countries affected by the trade war. So again, I come back to this theme of ‘are you changing and are you moving with speed to react to the issues and the challenges in front of you? In some cases, it is challenge, but it might be an opportunity. That is where I think some of the countries around the world might be more of an advantage for you than you think. So let’s figure out how to actually turn that negative into a positive. It is surprising that, according to your survey, Western European business leaders don’t see the trade war or protectionism among the top three risks (these are over-regulation, populism and policy uncertainty). How do you interpret this? What we saw this past year across the board was that there is just a lot more threats. So when you look at the European countries, you are probably more focused on issues like, for example, taxation and Switzerland. Or Brexit, where the UK’s departure goes from the EU perspective and the UK perspective. You are really focused on the scarcity of resources in terms of availability of talent. You are also really interested in some countries having over-regulation. It is not that these issues of the trade war have fallen down. In fact, they are there. It just happens to be that a few of the risks ended up being a higher percentage than the trade war issue. It is a question of how many other priorities exist right now. And how we actually manage for that uncertainty and the plethora of total risks and uncertainties that they all have to take into consideration to set the strategy. In your view, what is the number one concern for the next twelve months? For me is how you move with speed and execution to capitalise on the opportunities. Within every one of these challenges there is big opportunity for people. It is all about execution and moving with speed.